Finally I get to combine my love for dogs and fashion in a collaboration announcement. Teatum Jones and Brora Cashmere are launching a line of knitwear this season that features a variety of designs, but my favourites just happen to be the dog themed sweaters, including the yellow Dalmatian number I'm wearing herewith. It's bright, it's cashmere and it features a puppy. Seriously, could you imagine a sweater I'd love more? There are many more available, so take a look at the link below! 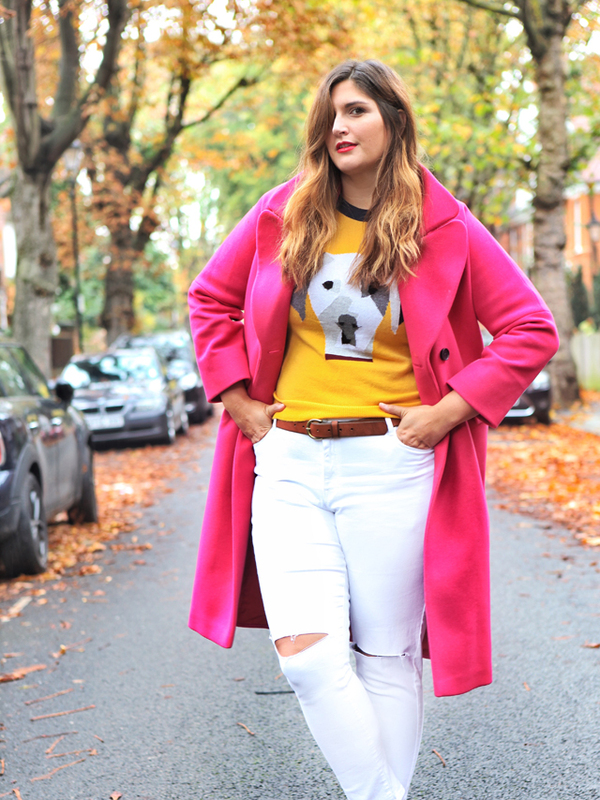 And as I'm all about new launches today, I've paired my bright jumper with a brand spankin' new coat from Jigsaw. Once again, I feel so obvious in this choice. What is it about a bright pink that makes me go weak in the shopping knees? Both are luxury loves that you'll be seeing again here on FFG! Now, just a word about the white jeans. I've said it once and I'll keep saying it until I'm absolutely clear. There are no rules when it comes to white jeans in 2017 and beyond. In fact, white jeans are just about the chicest thing you can wear in winter weather. If you're looking for baby steps in your "white jeans for winter" transition, try pairing your white jeans with an oversized neutral sweater and brown over the knee boots.